Limone is one of Italy's oldest Alpine ski areas, having welcomed skiers from the earliest days of the sport. It is a very picturesque old village centred around its twelfth-century church and other old buildings. Located a few kilometres from the French border it is equidistant from Nice and Turin. Only an hour's drive from the sea, the whole area has a very Mediterranean/'Real Italy' feel, with narrow cobbled streets, usually lively nightlife and gourmet food available. The ski area is very extensive, although the altitude latitude mix can make snow cover unpredictable at the season's ends. Over the past decade there's been a huge investment in new lifts with almost all of the 20 or so former drag lifts replaced by high capacity chairlifts and a fast modern gondola. When will it snow in Limone Piemonte? 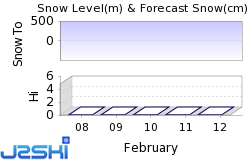 The next notable snow forecast for Limone Piemonte is 14cm5in, expected on 4 May. How High is Limone Piemonte? The Italian Ski Resort of Limone Piemonte has direct access to 90km56 miles of downhill skiing, with 46 marked pistes, served by a total of 29 ski lifts. With ski lifts as high as 2,050m6,726ft, snow cover is generally reliable. The most difficult run is the 'Olimpica'. Limone Piemonte offers good sking, particularly, for Intermediate skiers. Limone Piemonte offers some good boarding. When is Limone Piemonte open? We don't currently have confirmed season dates for Limone Piemonte. NOTE:- Lift and Piste openings are always subject to Snow Conditions in Limone Piemonte. Limone Piemonte is able to make snow, on 13km8 miles of ski runs, with 32 snow cannons. The 29 ski lifts of Limone Piemonte are able to uplift 22,000 skiers and snowboarders every hour. Limone Piemonte is in the Italian Alps in Cuneo, Piedmont, Italy. The nearest airports to Limone Piemonte are Turin Cuneo, Nice and Genoa. There are four airports within three hours drive. Turin Cuneo is just one hours drive away, in good driving conditions, so you can be on the piste quickly. Want to Know when it Snows in Limone Piemonte? Click above to get Snow Reports by e-Mail for Limone Piemonte. By doing so, you agree to Our Rules. Other popular Ski Areas near Limone Piemonte. Ski Hire Shops in Limone Piemonte. Common questions about Limone Piemonte. Want to ask about skiing and snowboarding in Limone Piemonte? Or contact Limone Piemonte Tourist Office. Note :- The information on J2Ski concerning Limone Piemonte, where not clearly factual, is opinion only and is neither definitive or exhaustive. Warning :- Snow Sports are Dangerous! Skiing, snowboarding and all winter sports involve risk of serious injury or death. You MUST confirm all information, especially snow and weather conditions, in Limone Piemonte before you ski or board. You participate at your own risk.